Ca' di Chio is for up to 5 guests. To optimise the quality of your stay, guest numbers are strictly limited to these with the possibility of 2 more in the cottage (see Owners Direct property ref IT2218). The view down the Val di Chio from the terrace to Castiglion Fiorentino on one side and Montecchio Castle on the other, is breathtaking, one of the best in Tuscany. The property is in a quiet and serene location bounded by ancient woodland and olive terraces. The grounds are extensive and border on National Park land. The house is stone built, full of character with many original features. Castiglion Fiorentino is 5 minutes drive away and has everything you require, including a main-line railway station. The larger historic towns of Cortona and Arezzo are 15 and 20 minutes away respectively. The private pool, with Roman steps, is situated on a terrace with extensive views. There is always someone available for maintenance purposes or to give any assistance required. En-suite bathroom to bedroom 1, with shower, wc and hand basin. Family bathroom on the first floor with bath, shower, wc, hand basin and bidet. The central hall with hand-made cotta floor has a large dining table and chairs, a very high ceiling with original chestnut beams and tiles. Very cool in the summer. The mezzanine has two large sofas, DVD player, wi-fi and and plenty of books and DVDs. The kitchen is fitted with oak units and a granite worktop. A range cooker with gas hob, electric oven, fridge/freezer, microwave, dishwasher, toaster and a full selection of glass, china and equipment. Table and chairs. Window overlooking terrace. The pool is shared with our 1 bed cottage. See Owners Direct property ref IT2218. Notes on accommodation: Our primary objective is to give our guests the best experience possible and a special holiday. The accommodation is spacious and we could accept larger guest numbers if we chose to. However, we strictly limit numbers to optimise the quality for our guests. So, unlike many other places that optimise numbers, we optimise quality! The house has gas-fired central heating which is charged at cost price as used, in the cooler months only. There are no other service charges. Cotton bed linen and all towels, including pool towels, are provided. Weekly change. Hot water is via a new solar panel system. There is wireless internet (bring your laptop). Washing machine, iron and ironing board are available on request. No smoking except on designated paved/gravel areas outside. A welcome pack for breakfast is provided, including tea, coffee, milk, cereal, fruit juice, fruit and bread items. Outside: The property is easily accessed via a short white road through vineyards. The views all around are amazing, some of the best in Tuscany. 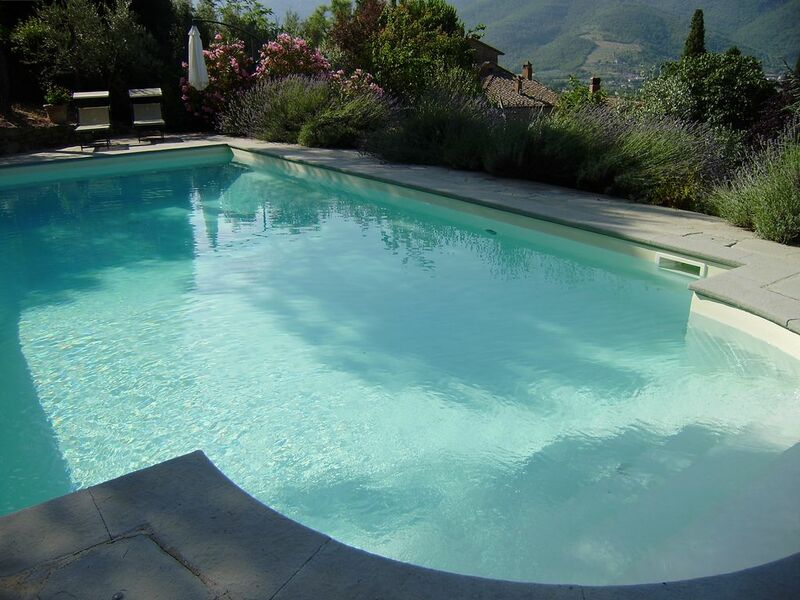 The pool is 10x5m and is 1.4m deep at the shallow end, with Roman steps and 2.4m at the deep end. It is set amongst olive and pine trees on a terrace just above. There are ample sunbeds and umbrellas and a heated pool-side shower. It is shared with our 1 bed cottage (see property ref IT2218). A shady gazebo with table and chairs allows relaxing with a book, or a cool drink amongst the olive trees. Wildlife is abundant here, the property being on the edge of a National Park. You might see anything from a wild tortoise to a porcupine, or a hoopoe to a hawk. You are free to roam in the extensive grounds and beyond. You can walk forever if you wish! You will ideally have a car to get you to town or beyond, but we can organise taxis for you, to the Railway Station for example, or help you plan your trips, if you wish. Ample parking available. Cleaning / Towels / Linen / Maid service: Cotton bed linen and all towels, including pool towels, are provided. Weekly change. Other: A table and chairs are on a large private gravelled terrace next to the kitchen. Perfect for summer evenings. Washing machine on request. My husband and I spent our 30th wedding anniversary in Tuscany. This home is historic and magnificent, extremely clean with a large well equipped kitchen. It was within a short driving distance from several beautiful walled cities, we visited Castiglion Fiorentino, Cortona and Siena. Although there was only two of us we stayed in the two bedroom unit, plenty of room for another couple or children. They have a large kitchen, dining room and seating area. No television but a VCR with videos. We had an iPad and were able to download shows and movies to watch at our convenience. Barbara and John are amazing hosts and take so much pride in their home. They provided a welcome package that included coffee, milk, tea, fruit, fresh flowers and herbs. We will return someday. Beautiful setting, gracious hosts, well stocked kitchen, proximate to services and for day trips.. Spent two weeks at this beautiful historic place. Well equipped and well functioning villa had everything we needed. Really spacious and more than enough for five persons. The kitchen had everything needed for making home cooked meals. The pool area was very nice and we had it all to ourselves. The pool was cleaned every morning and there were quality sun beds for all of us. From the pool area there was a beautiful view over the hills. Our host Barbara was absolutely fantastic. Very helpful and always ready to give advice. Barbara really knows how to be reachable without being intrusive. We would love to come back. We spent a week at Barbara's beautiful villa at the end of June.The house is spacious and well equipped with everything we needed. The outside space is gorgeous and we spent lots of time in the lovely pool which had great views. The location is great, train station is five minutes drive and we visited Florence by train. We drove to Arezzo and Cortona, both close by and lovely. Castiglion Fiorentino is also a lovely town to visit. Barbara was so helpful and we got lots if great advice from her about our day trips, restaurants and local information. A wonderful villa in a lovely location, I can highly recommend it. A perfect place to rest and unwind. We absolutely loved our stay and from the moment we arrived Barbara and John could not have been more helpful. The house and gardens are fantastic set in acres of olive groves where you can walk freely. Being a keen photographer I was able to take lots of fabulous images of the local countryside and got some amazing shots of rare butterflies. My partner sat and painted the views from our villa with a glass of wine for company. The local train station was a bonus enabling us to visit Florence and Arezzo and the care got us to Sienna and other local villages. We could have happily stayed much longer and were sad to leave this fabulous place.Hopefully we will make a return visit in the future. Thank you Barbara and John for being such attentive hosts. Our 9 day stay at John Singleton's villa near Castiglion Fiorentino came at the perfect time during our 42 day trip through France and Italy. It bookended our prior 3 day stay in Florence and our upcoming 9 day stay in Rome. The peaceful countryside surrounding the villa was a welcoming contrast to the hustle and bustle of the city and its nearness to many interesting hill towns and other nearby attractions (Lake Trasimeno) made it a great jumping off place for short road trips. It was especially nice to come home to after visiting one or another of the hill towns and to take a short afternoon nap before opening a bottle of local wine and enjoying the dimming of the day and the beginning of evening in the fall in this beautiful part of Tuscany. Being in eastern Tuscany, we are 2 hours drive to the sea, but Lake Trasimeno with its beaches, water sports, boat trips and historic towns and markets, is 30 minutes away by car or 20 minutes by train (Castiglione del Lago). The nearest airport is Perugia (45-60 minutes drive). Ryanair flies there 4 times a week. Meridiana flies to Florence (1 hour drive). Ryanair and EasyJet have regular flights to Rome Ciampino (2 hours drive or train/bus), Pisa (2 hours drive or train), Bologna and others. Jet2 flies to Pisa. There are well stocked local shops which are open late, and there are supermarkets in Castiglion Fiorentino, 5 minutes drive away. The ancient and wonderful Cortona with its unbelievable views and typical Tuscan restaurants, and Arezzo with designer shops on one hand and medieval arts and Roman amphitheatre on the other, are 15 and 20 minutes away respectively. Siena is a 1 hour drive away and Florence is 1 hour by car or train. We are 20 minutes from the main north/south A1 autostrada. Tuscany has very strict planning controls and protects its heritage. Its many historic towns and treasures must be experienced. The local outdoor markets are marvellous and there are banks and supermarkets in the local towns. The market in Castiglion is on a Friday. Arezzo has a famous monthly antique market (first Sunday of the month and preceeding Saturday). The wine growing areas of Chianti to the North, and the area producing the Brunello and Vino Nobile (Montalcino and Montepulciano) to the South, can all be reached within 1 hour. Highly recommended. The owners will give you all details you require. Booking Notes: Booking will be held pending receipt of deposit. A deposit of 25% is required immediately, with balance payable 50 days before check in date. For late bookings, within 50 days, full amount is due on booking. On cancellation, we will give a full refund if you tell us at least 50 days before check in date, or in any case if we are able to rebook the period. Otherwise 25% of the booking price, if paid up, is refunded. Changeover Day: Changeover day is normally Saturday. Please arrive after 4:00pm and depart before 11:00am. In low or mid season we are flexible on the booking period and do pro-rata for stays other than 7 days. Notes on prices: Prices are per week in UK Pounds for 2015. Payment in euro is accepted at the prevailing rate. Gas is charged at cost price as used, for winter heating only. There are no other charges.